GREEN BAY – Jared Cook no longer is in the Green Bay Packers' future, but the big, athletic tight end left behind a valuable lesson in his lone season with the team. Not until Cook returned from an ankle injury last season did the Packers' offense resuscitate. Aaron Rodgers was a different quarterback before and after Cook’s return. The Packers were a different team. A dynamic tight end can be the centerpiece in coach Mike McCarthy’s offense. It was that way with Jermichael Finley. Same way with Cook. So general manager Ted Thompson broke from his normal routine this time of year, signing Pro Bowl tight end Martellus Bennett on Friday. He doubled down 24 hours later. The Packers announced Saturday they signed Lance Kendricks, an athletic, 29-year-old receiving threat who will join Bennett to give the Packers their most dynamic tight end duo in McCarthy’s 12 seasons. 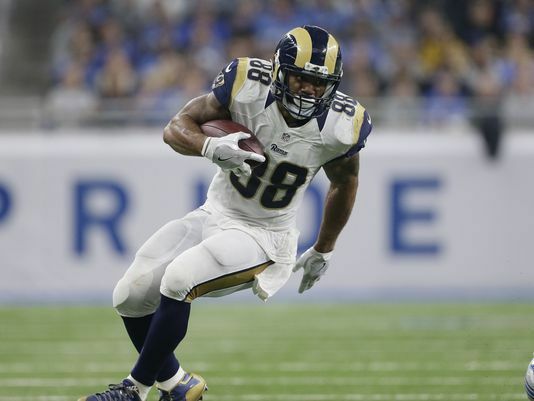 Kendricks was released Thursday after six seasons with the Los Angeles Rams. Because he was released, Kendricks was a “street” free agent and won’t count against the Packers' compensatory draft-pick formula. That’s a different distinction than Bennett, the first unrestricted free agent the Packers have signed since 2012. Kendricks, a Milwaukee native and consensus All-American at Wisconsin, was released after a career year in 2016. He caught 50 passes for 499 yards and two touchdowns, impressive numbers considering his quarterbacks were veteran Case Keenum and rookie first-overall pick Jared Goff. In Green Bay, Kendricks will play with two-time MVP Aaron Rodgers. And he’ll have company. It’s a dramatic overhaul of the offense. In 24 hours, the Packers added 105 catches for 1,200 yards and nine touchdowns in 2016 production to the tight end position. The two signings came after Rodgers said the Packers should go “all in” after their NFC championship game loss at Atlanta. Adding Bennett and Kendricks three days into free agency is a sign Thompson will follow suit. Importantly, the quarterback is sure to be pleased. The Packers started free agency re-signing top sacker Nick Perry to a five-year, $60 million contract that will count only $5.85 million against the 2017 salary cap. Bennett’s three-year, $21 million contract will count only $3.85 million against the 2017 cap. Their deals left roughly $28 million in cap space, according to NFLPA numbers. Terms of Kendricks’ contract were not immediately known. Right guard T.J. Lang and running back Eddie Lacy remain unsigned. Dire needs at cornerback and edge rusher also remain on the defensive side of the ball. But tight end, with its prominence in McCarthy’s offense and lack of talent and depth, was among the most pressing needs on the roster. The Packers played most of last season with just two tight ends on their 53-man roster. When Cook missed six games because of an early ankle injury, the Packers were 2-4. Cook returned four days before Thanksgiving, helping the Packers run the table to a 6-1 finish and NFC North title. With Cook out, Rodgers completed 63 percent of his 369 passes for 2,410 yards, 22 touchdowns and seven interceptions with a 93.9 passer rating. In the seven games after Cook’s return, Rodgers completed almost 70 percent of his 241 passes for 2,018 yards, 18 touchdowns, no interceptions and a 120 passer rating. Now, the Packers have two tight ends who can stretch the middle of the field and win one-on-one battles. The Packers are expecting Bennett and Kendricks to more than duplicate Cook’s production. Bennett averaged 12.7 yards per catch last season in New England, where he received passes from Tom Brady. Kendricks, despite the Rams quarterback play, averaged 10 yards per catch. Kendricks has played in an offense with multiple tight ends before. 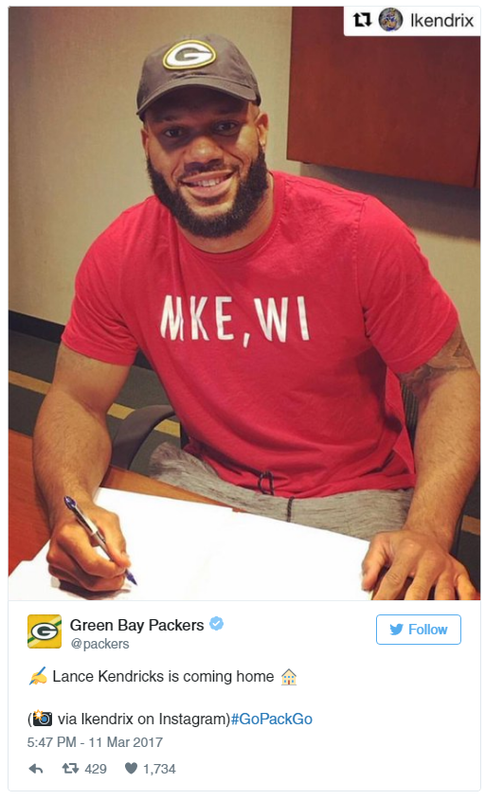 He was Cook’s teammate for three seasons with the Rams before Cook signed with the Packers last fall. The Packers had entered free agency hoping to re-sign Cook and were close to a deal, but talks broke down by Friday morning. Thompson quickly recovered. First Bennett, now Kendricks. Together, they form a dynamic tight end duo.